I’ve been asked a few times for complete component recommendations in order to build a mining computer, so here’s a list of parts you’d need to build your own crypto mining computer with parts that are currently available. The main part of the rig is obviously the GPU(s). I recommended GTX1060 3GB version a while back, but now I recommend the GTX1070 GPUs due to more onboard memory, though a little pricier. The limited 3GB of the GTX1060 card will restrict which coins can be mined in the very near future (especially ETH). Mind you just because you won’t be profitable to mine ETH with a GTX1060 doesn’t mean you can’t mine other currencies that are still very profitable, so don’t get discouraged. The GTX1060 3GB cards are still great value and pack a great hash rates at a low entry cost. Once overclocked a little, each GTX1060 will get you about CAD$4-$4.5 return per day, and each GTX1070 will return about CAD$5.5-$6.5 per day. I would stay away from the GTX1080 GPUs as their price is double that of the GTX1070, and only provide 20-30% more performance. 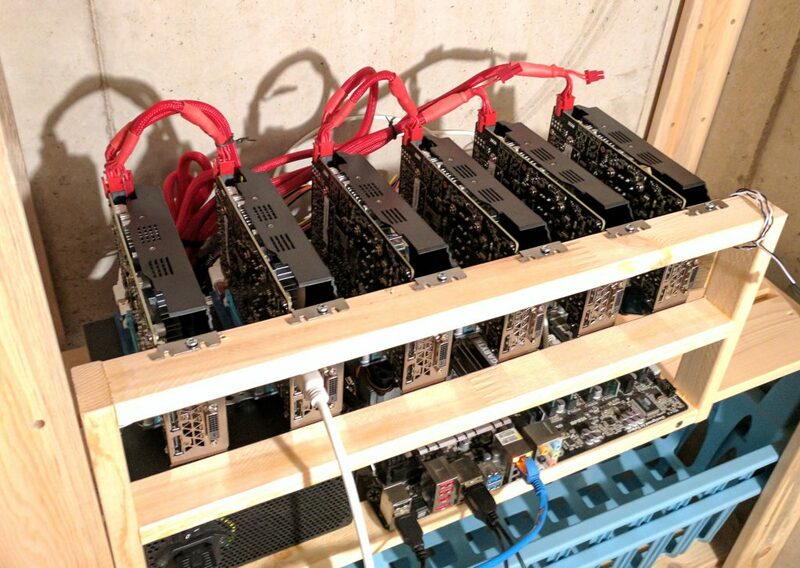 As for make and model of GPUs, I’ve used a dozen different makes and models, and they all are pretty equal in mining performance, so price and availability should dictate your selection. One thing to be mindful about is the power connector on the GPU. Stay away from GTX1070 GPUs that need 2x8pin power connectors. Stick with the ones that need only 1x 8pin power connector. This will ensure your PSU will have enough cables to power more then 4 GPUs. Shop around for the best deals, though they are getting harder to find. If you’re not planning on doing a 8 GPU rig, then any motherboard with 4, or 5 or 6 PCIe slots will do. All the slots (yes even the PCIe x1 slots) get used on the motherboard. You won’t physically be able to mount 7 GPUs on any motherboard, so you’ll have to use some pcie riser cables, to extend the motherboard’s pcie slot to wherever the GPU will sit. The current best pcie risers are the usb3 pcie risers. You’ll need one per GPU. Second to the USB3 risers, are the powered ribbon cable risers, and as it seems the price for usb risers has gone from $15 to $80, the parallel cable ones for $5 are a great bargain. Next you’ll have to power all these components, so a PSU will be your next item to choose. A rig with 6x GTX1060 3GB GPUs will pull from the wall about 750W. A rig with 6x gtx1070 GPUs will pull close to 1000W from the wall. Typically a well-tuned GTX1060 3gb GPU will draw about 90W and a well-tuned GTX1070 will draw about 140W. The remainder is power that the motherboard/CPU/ram/HD needs, which is likely in the neighborhood of 70W-150W depending on what CPU and mobo you have. For 6 or even 8 GTX1060 GPUs, you’ll be fine with a 1000W PSU. For 6x GTX1070 GPUs you’ll still be on the limit with 1000W PSU, but it’s very doable. For more then 7 or 8x GTX1070, you’ll want wither two PSUs (750W each), or one larger psu in the order of 1200-1300W. As for CPU selection, go with a low power unit. Even a Celeron or i3 is plenty as cpu does very little. Memory consideration is 8GB as any more is wasted. All the bits don’t fit in a regular case, so you’ll have to do some google image searches to see how others have fastened multiple GPUs together. 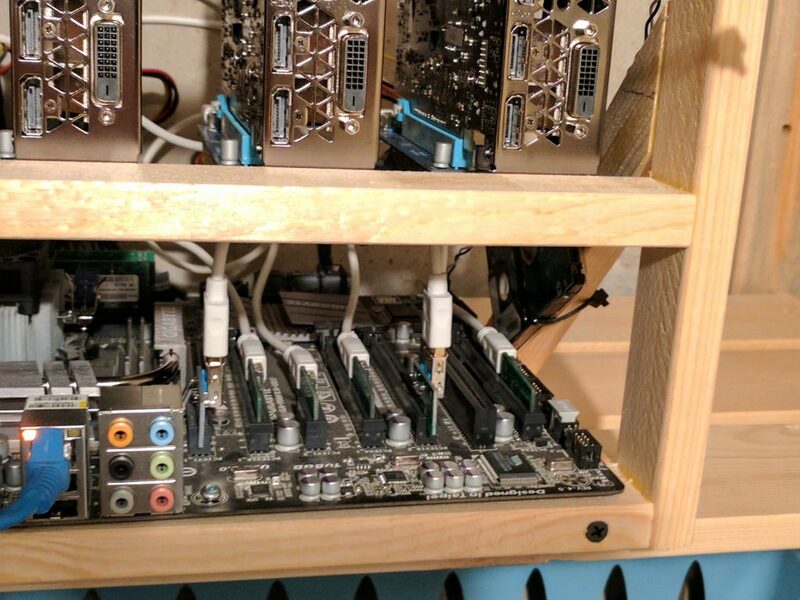 Image search for “GPU mining” or “gpu mining frame” will give you lots of ideas. I make my frames out of wood, and if you’re handy with a saw, you can make your own wood frame for very cheap, or buy an aluminum one. You can even use a milk crate if you’ve got no budget. Assuming you’re mining to make some coin, at the end of the day you want to be as frugal as possible with your purchases. Don’t buy fancy water cooling systems for GPUs, or fancy motherboards, or overpowered PSUs. All extra money spent on luxury features is wasted.